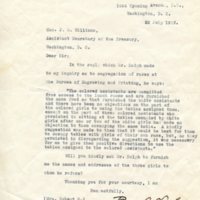 "The colored assistants are permitted free access to the lunch rooms and are furnished the same food as that furnished the white assistants and there have been no objections on the part of the colored girls to using the tables assigned them, except on the part of three colored assistants who persisted in sitting at the tables occupied by white girls after one or two of the white girls had made an objection to them occupying the same table. A kindly suggestion was made to them that it would be best for them to occupy tables with girls of their own race, but, as they persisted in disregarding the suggestion, it was necessary for me to give them positive directions to use the tables assigned to the colored assistants." Will you kindly ask Mr. Ralph to furnish me the names and addresses of the three girls to whom he refers? 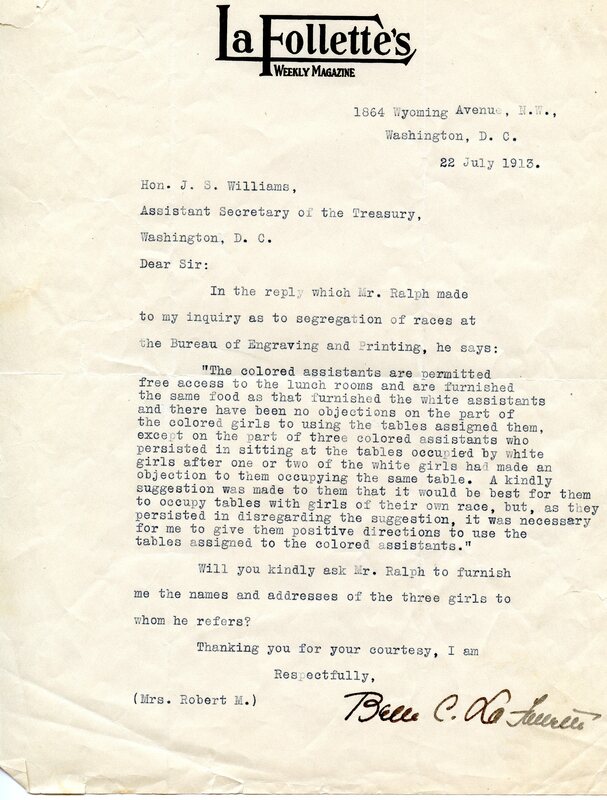 La Follette, Belle Case, 1859-1931, “Belle C. LaFollette to JS Williams,” 1913 July 22, SE072413a, Race and Segregation Collection, Woodrow Wilson Presidential Library & Museum, Staunton, Virginia.